ISLAMABAD: The Supreme Court (SC) on Thursday ordered the State Bank of Pakistan (SBP) to submit a sealed report in seven days containing details of all transactions above $50,000 carried out from Pakistan during 2017-18. 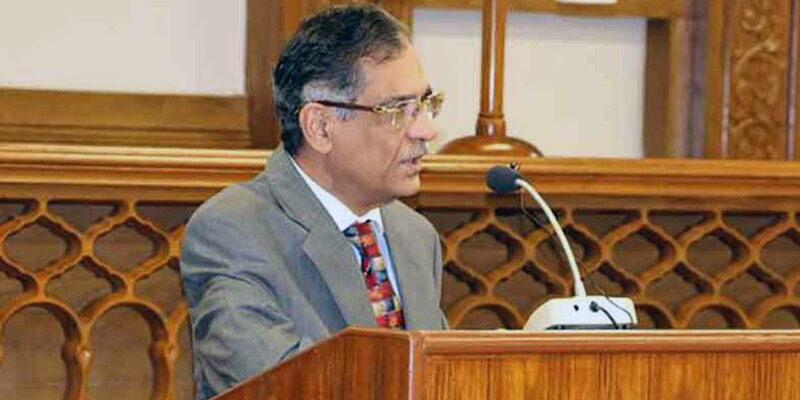 A three-judge bench, headed by Chief Justice of Pakistan (CJP) Mian Saqib Nisar, passed the instructions during a suo motu hearing of a case pertaining to foreign bank accounts owned by Pakistani citizens. The top judge, focusing on Pakistan Tehreek-e-Insaf (PTI) leader Jahangir Tareen, also asked about the amount of money transferred abroad by the PTI leader. “Jahangir Tareen made assets abroad, but stated otherwise in the balance sheets,” the CJP remarked, adding that the SC should know of Pakistani citizens holding accounts and properties in Switzerland. “Such policies were made for their own benefit, through which money can be transferred abroad,” CJP remarked, adding that the aim is to take advantage of the amnesty scheme before September. Earlier this month, Prime Minister Shahid Khaqan Abbasi announced a tax amnesty scheme aimed at broadening the tax net and offering wealthy Pakistanis the option to declare their hidden assets in Pakistan and abroad. Pakistanis having offshore assets can bring them back by paying only two per cent tax. However, in case of declaration of a foreign fixed asset only, tax applicability will be three per cent while foreign liquid assets including cash, securities and bonds can be declared on five per cent tax payment. PM Abbasi also offered to legalise the hidden local assets at five per cent. Last month, the top court had tasked a 13-member committee to suggest ways to trace and retrieve assets from abroad in view of a suo motu notice on the ill-gotten money of Pakistani citizens in foreign banks. The bench approved a committee comprising SBP Governor Tariq Bajwa, Federal Board of Revenue (FBR) Chairman Tariq Pasha, Additional Attorney General Mohammad Waqar Rana, senior lawyer Khalid Anwar, SC Advocate Ikramul Haq, Finance Secretary Arif Ahmed Khan, Shabbar Zaidi, Mehmood Mandiwala, Bashir Ali Muhammad, Tariq Paracha, Nisar Muhammad Khan and their terms of references (TORs) for retrieving money deposited in foreign accounts by Pakistani citizens. The TORs put forth by the committee included conducting a diagnostic analysis and layout of the current landscape related to the outflow of foreign exchange from Pakistan resulting in accumulation of assets abroad by Pakistani citizens. It also includes examining existing legal regime and practices; bilateral treaties and multilateral conventions that can be used to stem the unregulated outflow of foreign exchange from Pakistan, tracing of undeclared assets held abroad by Pakistani citizens and retrieving such assets especially ones generated with proceeds of crime. It suggests a study of steps taken by other countries to trace and retrieve assets of their citizens in foreign countries.